There is a phrase that has been floating around the inbound marketing industry lately, and honestly, it is starting to scare me a bit. Not because it is actually horrific, but because it probably means a whole lot more work for me and my content counterparts. What is this heavy-weight phrase? Personalized Content. Don’t get me wrong, I want all of my content to be keen and clever. 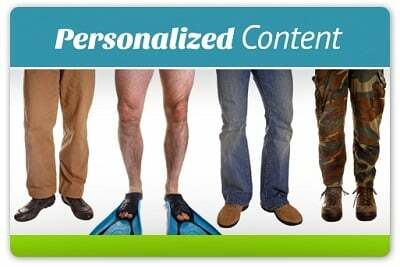 But Personalized Content actually refers to the copy on a website (or ad or email) that changes based on terms searched by visitors or their past behavior. Basically, the website tries to understand what each viewer is looking for and then provides that information immediately. To get a better grasp on the term, take the idea of Amazon’s recommendation algorithm and apply it to the entire site and you’ve got Personalized Content. While Personalized Content is not available quite yet from HubSpot (Smart CTAs, Forms and Images are already available), we assume it is on its way. In the future, you will most likely be able to change paragraphs, headlines and landing pages, in addition to images, forms and offers. Why Bother with Personalized Content? Over the past few years, marketers have realized that relevancy is one of the most important elements to their success. That is why we spend numerous hours and copious amounts of energy depicting buyer personas. So now that these personas are determined, why would we send them all to the same place to receive the same content? Ideally, you wouldn’t, and soon you won’t have to. We already know leads who are nurtured with relevant information produce a 20 percent increase in sales opportunities versus non-nurtured leads. Why not start the process off with a bang—or better yet, Personalized Content from the visitors’ very first interactions with your site? You know what this means: Personalized Content helps you get the right content to the right person at the right time from the beginning. While Personalized Content will be doubling or probably even tripling a content writer’s workload, it is good for the visitors. Keep in mind that Personalized Content should help you compose a personal and easy-to-navigate experience for your audience, not a complicated one. When it comes to strategy, ask yourself how changing up the content will improve customers visits on your website without confusing or overloading them. To get started, consider integrating Smart CTAs to remove any offers leads have already downloaded from their view. To learn more, read this blog. Search Term: Let’s say you offer services to several positions within your target businesses. Using Personalized Content, you could send each visitor to the most relevant information based on the phrase he or she entered into Google rather than a generic homepage. Buyer Persona: As we mentioned, you may have several buyer personas, and they may be diverse in nature. Sending them all to the same page of generic content may turn them off to the site completely. Personalized Content can help develop a customized experience for each persona. Perhaps you can tailor your content and images to reflect separate industries—one webpage for manufacturing, one webpage for healthcare and one webpage for technology. Each persona will feel that you understand them and what they need, helping them move forward in your sales funnel. Lifecycle Stage: As leads move through your sales funnel, their concerns and needs change. They may have come to your website with problems to solve, and each time they return they may be closer to making the final decision to purchase. By taking into account the number of visits to your site a lead makes, you can offer information that gradually becomes more product-centric (or salesy) the closer the lead gets to the bottom of the funnel. This way you don’t scare off someone who is just browsing, and you won’t miss the chance to sell to someone who is ready to make a purchase. It’s true, Personalized Content may increase the workloads of content marketers across the industry. But it will be worth it so long as you research, understand and use the insights your visitors and leads have left behind on your site, including their preferences, concerns and past behavior. 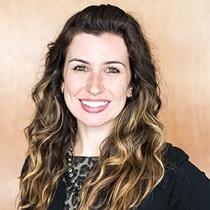 Use Personalized Content to connect with your potential buyers on a more personal and in-depth level, and your extra efforts can yield extra customers! What do you think about the new idea of Personalized Content? Share your thoughts in the comment section below. And to learn more about Personalized Content and implementing it into your content marketing strategy, download this free guide today.